Ammon Hennacy, a courageous activist who joined the Catholic Worker in the 1950s, said he was inspired to become a Catholic by the example of Dorothy Day. Specifically, he referred to an occasion during Mass when the organist began to play “The Star Spangled Banner.” As everyone else stood up, Dorothy dropped to her knees in prayer. Dorothy did not like that story; she did not think that was the right reason to become a Catholic. But she did not dispute Ammon’s account. In his view, Dorothy’s action represented a courageous repudiation of the blurring of cross and flag (and sword) that went all the way back to Constantine. I thought of Dorothy when I saw images of N.F.L. players “taking a knee” in protest during pre-game renditions of the national anthem this past weekend. Of course, the context is very different. Possibly, the players, who were protesting racism and making a gesture of defiance against a president’s provocative appeals to white nationalist grievance, did not exactly think that they were “praying.” But the symbolism of dropping to a knee in the midst of a patriotic ceremony would not be lost on Dorothy. Though not really a football fan, she would surely have understood and honored their protest. The symbolism of dropping to a knee in the midst of a patriotic ceremony would not be lost on Dorothy Day. Dorothy stood with those who questioned authority, who followed their own lights, and raised a nonviolent witness to justice, equality and human dignity. She loved her country and she loved the church, and part of that meant knowing when to stand and when to kneel, when to sit still and when to march. You could say that Dorothy “took a knee” when she refused to collaborate with New York’s compulsory civil defense drills—rehearsals for doomsday—by sitting in City Hall Park. Like the N.F.L. players, she was charged with being unpatriotic, if not treasonous. But for her, protest and prayer were not entirely separate. If her life was a prayer for peace, it was also a protest against all the forces that demean and degrade life. That certainly would have included the forces of white nationalism and the devaluation of black lives. Those players who have “taken a knee,” undaunted by accusations that they are unpatriotic, have stood for something. And Dorothy, for one, would certainly have knelt with them—in a prayer for justice and reconciliation; in penance for the legacy of slavery and injustice. God help us. Is it a false meme? (I maintain it is a false meme they are protesting) If it is a false meme, then where did the falsity arise? Why aren't America editors and authors correcting this falsity? Where should they be standing? all the forces that demean and degrade life. What are these forces? Where do the forces come from? Can they be stopped? This is just another example of an America article that relies on emotion and not reason and certainly not any evidence. It uses a false metaphor by comparing the athletes to Dorothy Day which is really an insult. The NFL players who "took a knee" were demonstrating their disrespect for the American flag. My father fought most proudly in World War II. Such nonsense coming from coddled, extraordinarily over-paid, publicity-seeking individuals is beyond the pale. I do agree that they have every right to express their "free speech"; however, I do not condone their method or support their nonsense! And, I have every right to find their expression offensive! They have no sense of the many men and women who gave their lives in sacrifice to see our flag wave and to salute our flag with honor. My father served in Korea during wartime. He is extremely proud of those standing up to Trump’s hypocrisy. When the POTUS shows blatant disregard for the first amendment, using potty language to describe a decent man of color, while calling KKK anarchists ‘fine men’, his dog whistle has been heard. If the draft dodger in chief wants to honor our men and women who served he should apologize to John McCain about his ignorant comments about captured soldiers, fight for full funding of programs that support veterans, and act like he has a fifth grade understanding of the constitution and our federal laws. Good for your dad! "The flag" is just a piece of cloth if it doesn't stand for our most deeply held American values, like the equality of all, black and white and brown, and the freedom to demonstrate our convictions, like those who are protesting the obvious continuing inequality of blacks in this nation in terms of death rates at the hands of our "law enforcers." It always mystifies me when Dorothy is held up as an idol. The blurring of cross and flag certainly pales in her bizarre mix of The Cross and politics. An anarchist who believed in a communal way of life fir all and a supporter of some of the most repressive and brutal communistic regimes in history does make her the very odd pacifist; perhaps her love for justice were only on her terms. "Solidarity" is one of those feel good terms which in reality is meaningless but looks oh so good, sort of like taking a knee. Bragging rights obtained by a perceived moral superiority are usually the very expensive and personal veneer on society. I can easily imagine Dorothy taking a knee at a war recruitment office in New York City where troops were enlisted to fight in the war to end slavery ( but where is Matthew Brady? ), maybe a prayer or two will suffice as long as it is well known. I agree, God help us all, for we are so caught up in the hero worship of pseudo saints that we do not have the courage nor the wherewithall to rectify injustice in this world without injecting the power of personal prestige into the equation. Or it's not about you Dorothy, it's about everyone else. A little mystery could be good for you, Christopher. Sad that you have a formula for how the Christian life is lived out, and Dorothy's way is not considered worthy by you. It's not about you either, Christopher. We need to change the system. We need to overthrow, not the government, as the authorities are always accusing the Communists 'of conspiring to teach [us] to do,' but this rotten, decadent, putrid industrial capitalist system which breeds such suffering in the whited sepulcher of New York. No, I never said it was about me but I do have the right to reject Dorothy as much as I see fit; irritating is it not? This is why I refer to Dorothy as idol. Holy smokes! So many wrong claims here, starting with the misspelling of Mathew Brady's name. Here is one of the biggest howlers: DD was "a supporter of some of the most repressive and brutal communistic regimes in history." I've read most of the biographies on Day and have never seen evidence of this. You may be confusing her unwillingness to support the American state with support for repressive governments elsewhere. Also, "solidarity" is a Catholic social teaching, not "one of those feel good terms." Day did not practice her faith as an exercise in ego renewal. If my incorrect spelling was the worst thing then that's OK. I apologize to Mathew. "What do you mean by anarchist-pacifist?" First, I would say that the two words should go together, especially … when more and more people, even priests, are turning to violence, and are finding their heroes in Camillo Torres among the priests, and Che Guevara among laymen. The attraction is strong, because both men literally laid down their lives for their brothers. "Greater love hath no man than this." "Let me say, at the risk of seeming ridiculous, that the true revolutionary is guided by great feelings of love." Che Guevara wrote this, and he is quoted by Chicano youth in El Grito Del Norte. 2. April 1953 CW on revolution: Yes. That is classic Dorothy Day. Wonderful! 3. Jan. 1970 CW on Ho Chi Minh: DD goes on to refute that she supports the brutality of the N. Vietnam government or the Vietcong (or the US and S. Vietnamese militaries for that matter)--"He spoke defensively as though I, as a pacifist, was on the side of the Vietcong. It is hard to talk to each other, the words of Christianity mean so little, “All men are brothers, God wills that all men be saved. Love your enemy. Deliver me from the fear of my enemies” so that I can be close enough to them to know and love them." Again, I urge you to read the full column and report accurately. 4. May 1970 CW: Ditto. In the full passage DD mourns acts of violence in the name of revolution (she was discussing the accidental detonation of a bomb by Weatherman in Greenwich Village). Sigh! Yes, I read your first link. It is difficult for me to misrepresent Dorothy and her ramblings. She was the salesperson of a weird mix of Christian talk and her own much more important politics. Like the scriptural thief in the night, she wanted to take what others had because she knew better. If verbosity makes one a saint I am certain she is a lock. I simply do not understand the idolatry of the Dorothy cultists. It horrifies me that such a person could ever be considered for canonization. Perhaps she started as a devout Christian but she ended up as a revolutionary, not for Christ of course, nor for love of others, but for love of power and control. She used scripture as a tool to tell where your freedoms exist, after all. Oh, whom the mortals make gods. I apologize for being so very strident. To sum it up, the charity of DD and her houses is definitely a Christlike activity. Her attempts to address politics and world economic systems were far, far beyond her abilities. The love of others does not mean the control of others even if one perceives themselves as having the best of intentions. Always beware of humans who believe too strongly in their moral righteousness. Peace in a violent world!! Troops were recruited to keep the south from becoming independent. Slavery was not un Constitutional at the time the south seceded. The north would send Black escapees back to their masters as the Dred Scot Supreme Court ruling declared escaped slaves property! And the court ruled that slaves would not be counted not counted as equal to whites. [ hence an underground railroad was needed to flout the law; the US law]. The government of the US could have outlawed slavery at any point in time but didn't ,until the war ended. Presidents owned slaves. So did some northerners. Northern abolitionists who owed ships were transporting African slaves to Cuba and Brazil even when it was illegal to bring them to the US. They made fortunes transporting slaves and in the ivory trade; ships laden with African slaves and ivory harvested from elephants by enslaved Africans, for use to make piano keys. Every respectable New England household had to have a piano! They were abolitionists yet rationalized that since they were so successful at this slave/ivory trade, it was a sign from God that it was acceptable to get rich off of slaves going to Latin America and the slave labor of slaves in the ivory trade. The northern banks lend money to southern slave owners to grow their plantations and buy more slaves. These northerners were Puritans with their; "if you're rich you must be good, and favored by God" and hyper capitalist work till you drop mentality ,which was in contrast to the easy going laid back lifestyle of white southerners. [ the civil war was a Cain and Abel story]. The history of the US is one of racism and white supremacism whether one was a southerner or northerner; Southerners have been the scapegoats for this history where whether one owned slaves or not, whether one approved of slavery or not, both the north and the south partook and benefitted from this original sin of America. The emancipation was the result of the civil war. Cessation and expansion was the cause. At least some of them are in prayer. Colin Kaepernick is a devout Christian with Bible verses tattoed on himself. Each Sunday for many years now some of us Americans have donned our vestments (with logos and numbers front and back) to celebrate the national athletic liturgy sponsored by the denomination known as the NFL. We even sometimes pass up attendance at our places of religious worship in order to be full participants in this football ritual from pre-game tailgate to post-game festivities. We enable the sort of exaggeration that has attached itself to the "taking of a knee" during the national anthem at recent contests. Grown men, with exaggerated importance being given them by way of their athletic prowess or salary size, who claim to be making a statement about equality even as they participate in organized and approved slavery with their "plantation" owners dictating far too much of their lives. We have made it all the more "patriotic," I suppose by insisting on the playing of our national anthem prior to each contest. No amount of convincing could bring me over the side of understanding why we do this. It cheapens the anthem, it sends us scurrying for appropriate and sometimes painfully inappropriate singers to belt it our, and it aligns true and genuine patriotism with athletic competition, paid athletic competition at that. How American, I suppose? Dorothy may or may not have taken a knee with them, but she sure as heck would not approve of the wretched excess attached to the sport itself and the following of it by our citizens. How can overpaid athletes successfully argue for equality if their protest does not begin at home? I do not see the similarity. Dorothy was an ultimate free spirit pursuing her own rebellion in her own time, on her own dime. Well paid athletes imposing their own agenda by disrespecting the flag and all it stands for is petulant behavior that even dishonors their fans. Dorothy was humble, her mode of life emphasized that virtue. The NFL is affluent and arrogant dishonoring a nations pride and deserving of rebuke by the nations elected representative. The Catechism of the Catholic Church 2239 instructs us that “It is the duty of citizens to contribute to…the good of society,” and that “the love and service of one’s country follow from the duty of gratitude” to their country. I don’t think the behavior of those who take a knee during the national anthem is contributing to the good of society, nor is it showing any gratitude or love to the country that has provided them with freedom and economic prosperity far beyond what most of their fellow Americans and those of any other country will ever have! What irony to see these multi-millionaires whining! But I suspect that those who malign their country in this manner have an agenda that is more to foment class warfare than to remedy real or perceived injustices; and I am sure of this when I see the player who was the originator of this infantile tantrum show up at a protest wearing a tee shirt glorifying Fidel Castro, who was one of the 20th century’s most egregious oppressors of human rights. Finally, destructive leftists who want to sow discord and division in American society---like these football players---have been around long before President Trump came into office. Trump is just their latest and most recent excuse to behave badly; and they are especially infuriated because Trump won’t back down to their tantrums like they are used to seeing. Trump was far from my first choice for president, but I applaud him for not backing down to the unprecedented assaults from the media, hollywood, academia, sports monopolies, both political parties, and liberals in and outside the Church. Evidently no one at America remembers Dorothy Day as I do. As a High School student in NYC in the 1950s I spent many a Friday evening at 223 Chrystie St., where a different speaker would talk about a subject of interest each Friday evening. Besides Dorothy and her imposing presence, there was Tom from Connecticut, a pacifist and conscientious objector, who even today is active in the anti-war movement. There was also The Irishman from Boston who was a veteran who felt he had compromised his beliefs by serving in the military. He seemed to have connections everywhere, and I remember him taking me to a dinner at the Spanish Libertarian League (an anti-Franco organization), and a meeting of ACTU (the Association of Catholic Trade Unionists) who unsuccessfully petitioned Cardinal Spellman to appoint a chaplain for them. Indeed, when asked whether the CW community were Catholics in good standing, only reluctantly and with much hesitation would the Cardinal admit that they were. 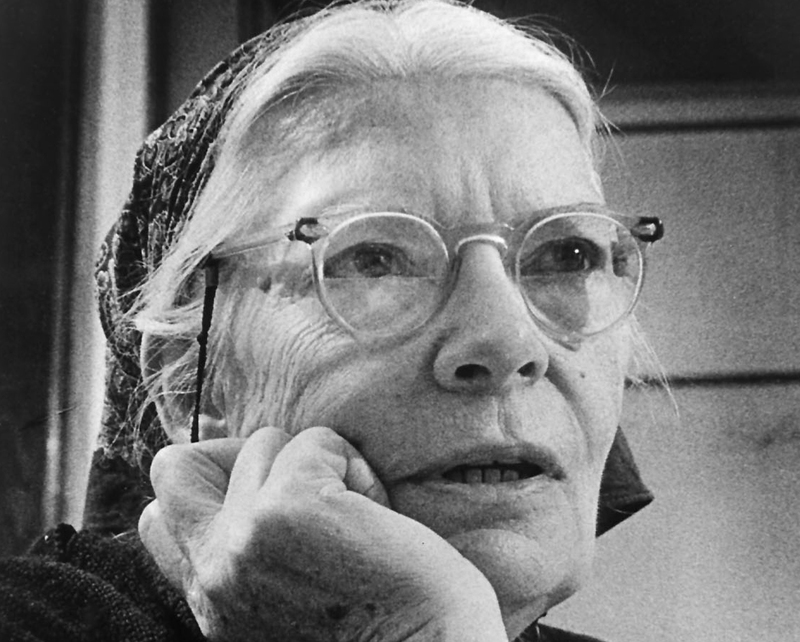 To compare Dorothy Day getting arrested in Times Square protesting nuclear arms to some cheap trickster millionaire athletes is absurd. I, too, object to the use of secular music for Mass.